Cathay's flagship lounge in HKG offers a stellar First Class ground experience, at least if it's not crowded. 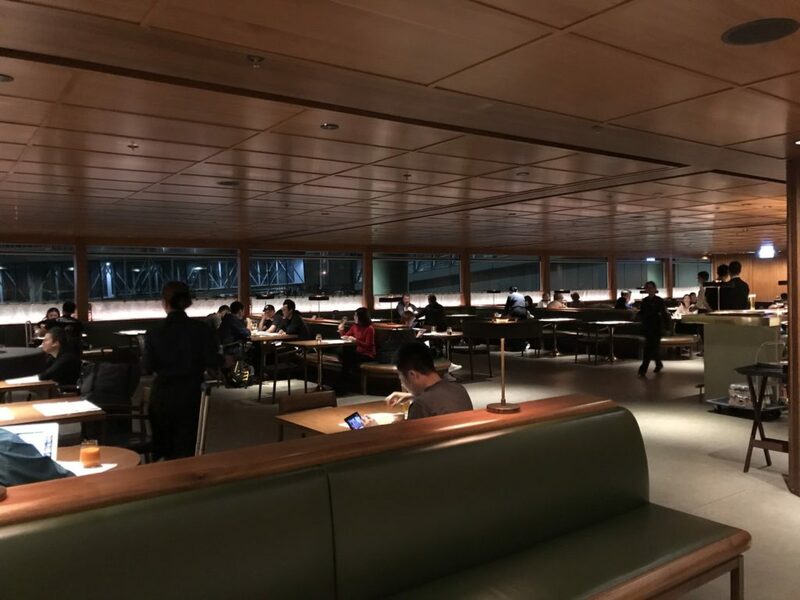 One of the things I was most looking forward to on this trip was the opportunity to review Cathay Pacific’s First Class lounges in Hong Kong. 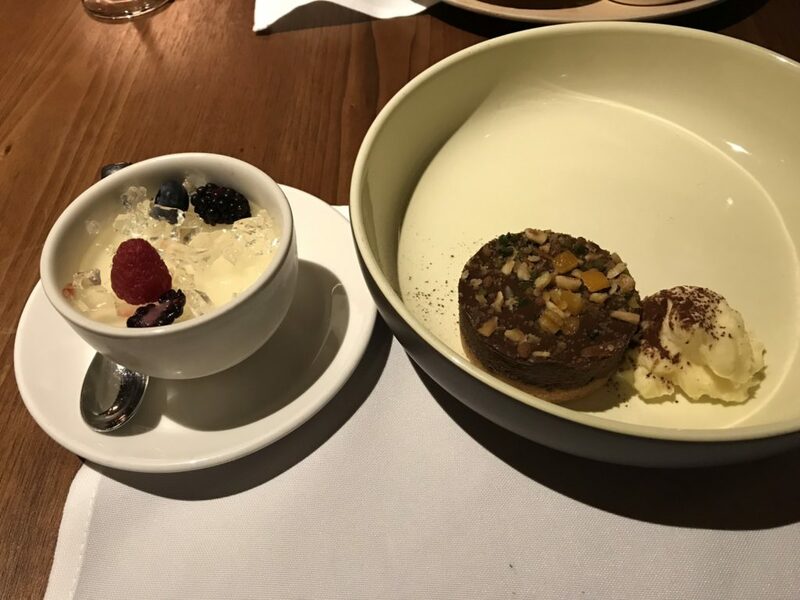 It may be a toss up between SQ and Cathay as to who has the better overall First Class product, but it’s generally accepted that Cathay’s First Class ground experience in Hong Kong blows SQ’s equivalent out of the water. 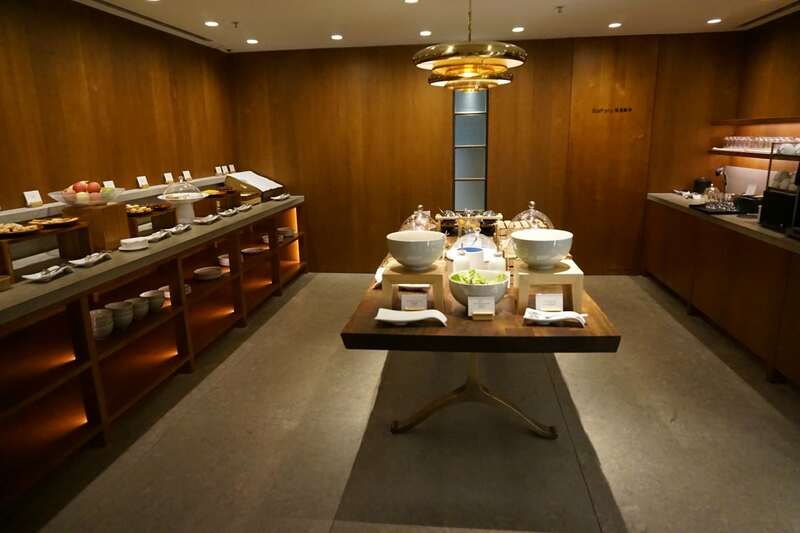 When talking about Cathay Pacific’s Hong Kong lounges, some orientation is helpful. 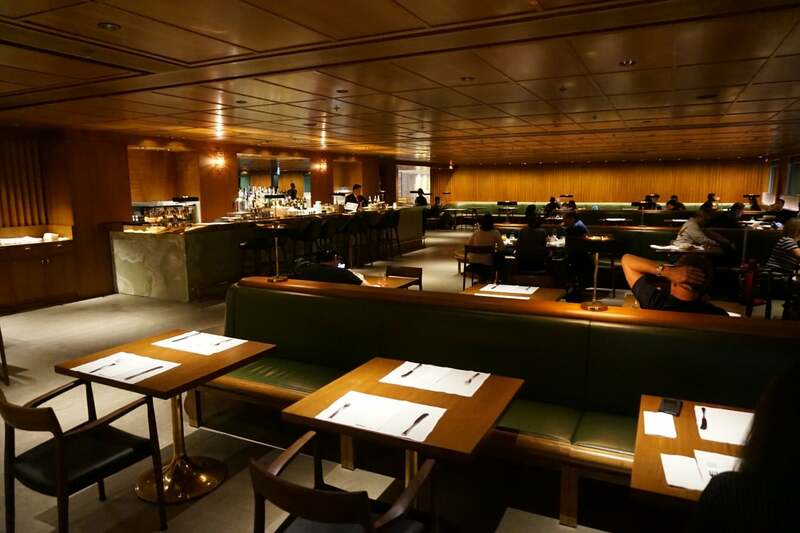 Cathay operates four different lounges in HKG, of which only two (The Pier & The Wing) have First Class sections. 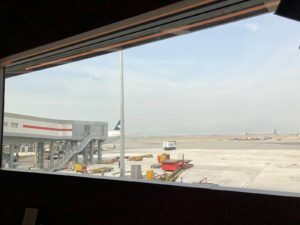 On this site there are reviews of the Business Class section of The Pier and The Wing, as well as the all-business class The Deck, but this would be the first time I stepped foot into the hallowed ground of the First Class area. If you’re planning to visit during your HKG transit, be sure to do some planning. 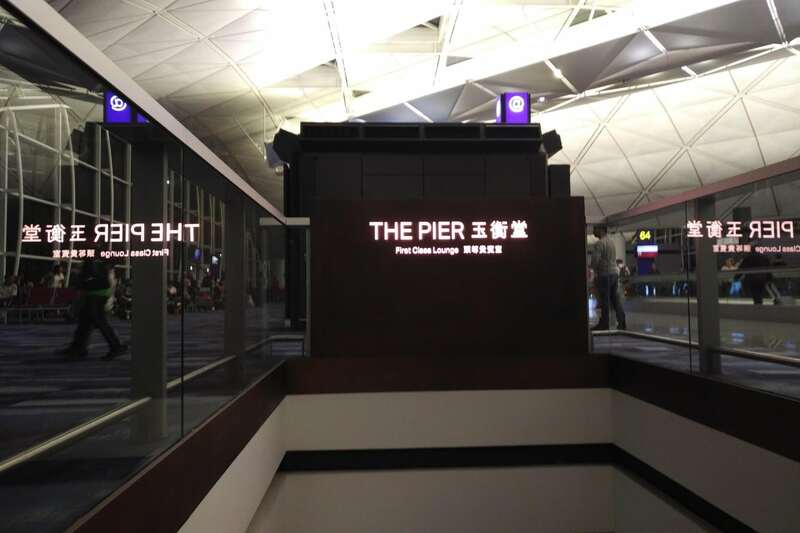 That’s because The Pier and The Wing are on opposite sides of the airport, and unless you have the mother of all layovers, it’s almost impossible to properly enjoy both on a single visit. 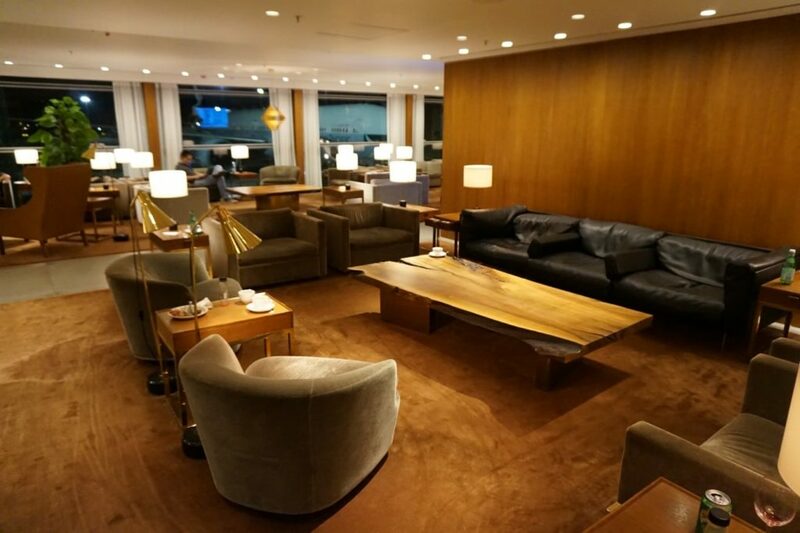 So, you’ll want to visit one lounge each way- keep your plans flexible, and visit the lounge that’s closer to your departure gate. For us, that happened to be The Pier. The Pier is somewhat less conspicuous than The Wing, given that it’s one level below the main departures concourse. You’ll need to keep a sharp eye out- don’t get on the travelator around Gate 61, or you’ll miss it. The escalator leads down to the entrance, where the reception staff will be waiting. A quick check of the boarding passes, and you’ll be ushered into The Pier, and possibly the most gorgeous corridor you’ll ever see. 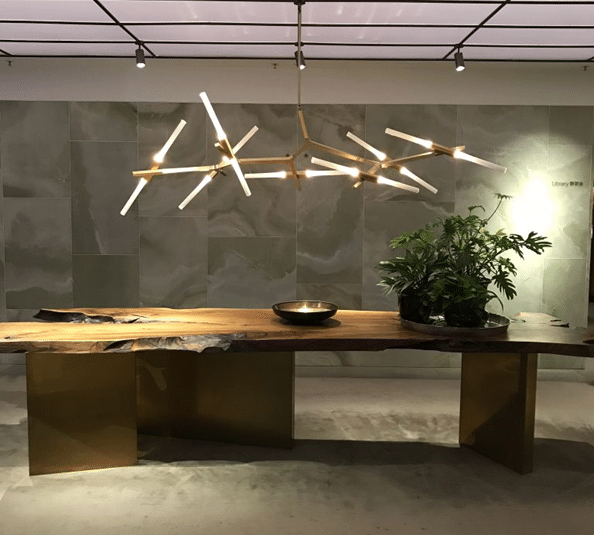 The Pier reopened in June 2015 after a massive renovation supervised by Studiolise, the London-based design studio led by Ilse Crawford. 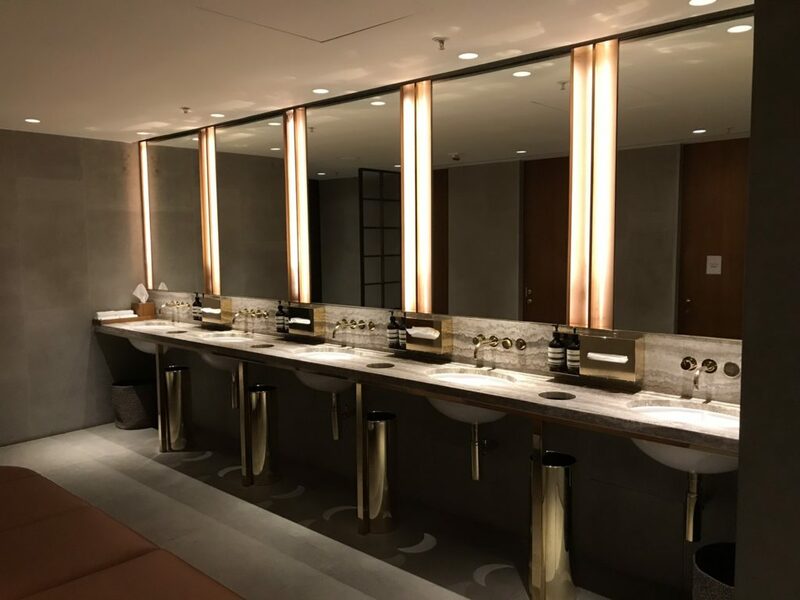 The 2,061 square metre facility seats a maximum of 231 passengers, with lush interiors featuring onyx, limestone and bronze. The corridor is the main artery of The Pier, running the entire length of the facility. 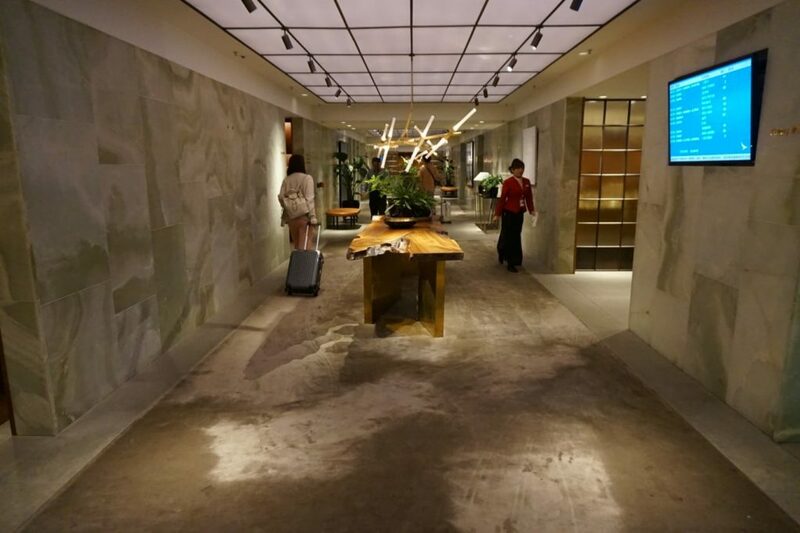 Although you’re below ground, there’s no claustrophobia thanks to the warm lighting, which makes the ceiling feel higher than it really is. 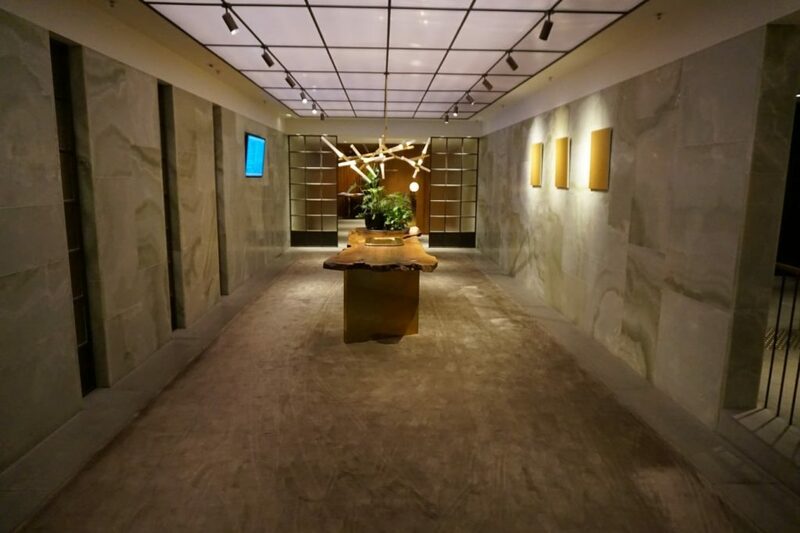 At roughly the mid-point of the corridor, you’ll see the shower rooms and spa treatment area called The Retreat, one of the highlights of the lounge. For future reference, 15 minute foot or neck/shoulder/scalp massages are available. 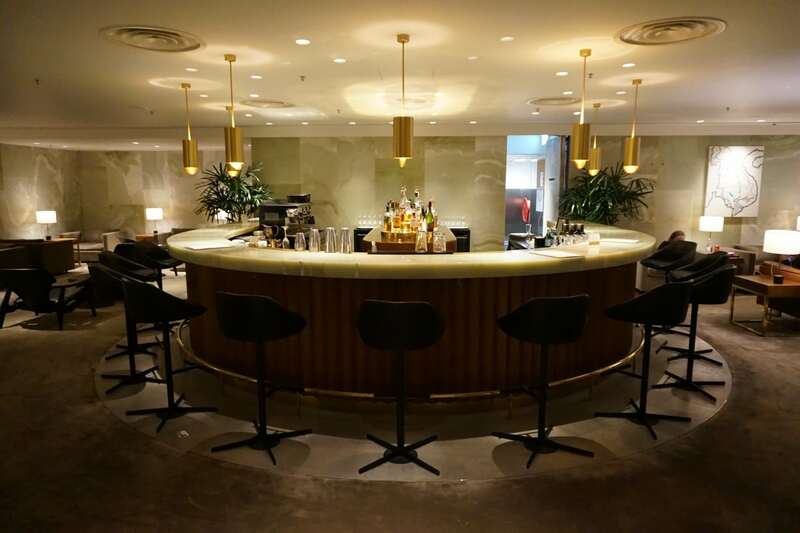 Unlike the British Airways lounge in Heathrow, it’s not actually possible to pre-book a treatment, so you’ll have to show up and hope for the best. 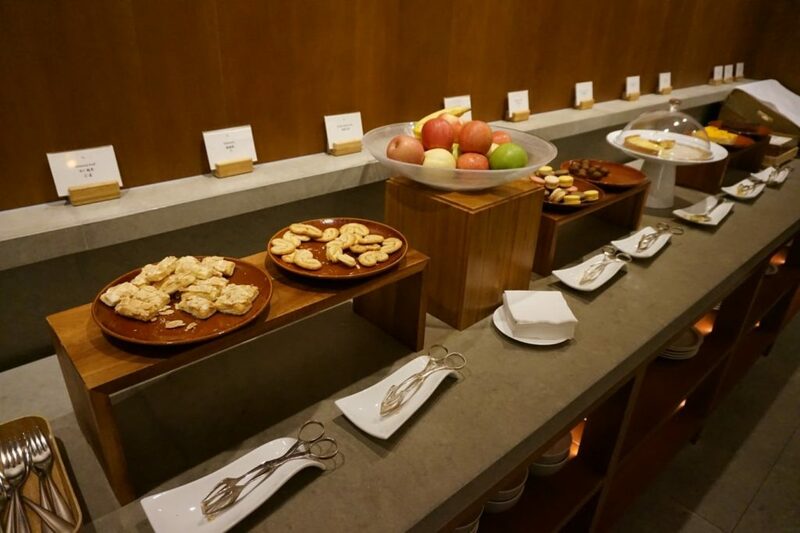 At one end of the corridor you’ll find The Pantry, the lounge’s self service food option. 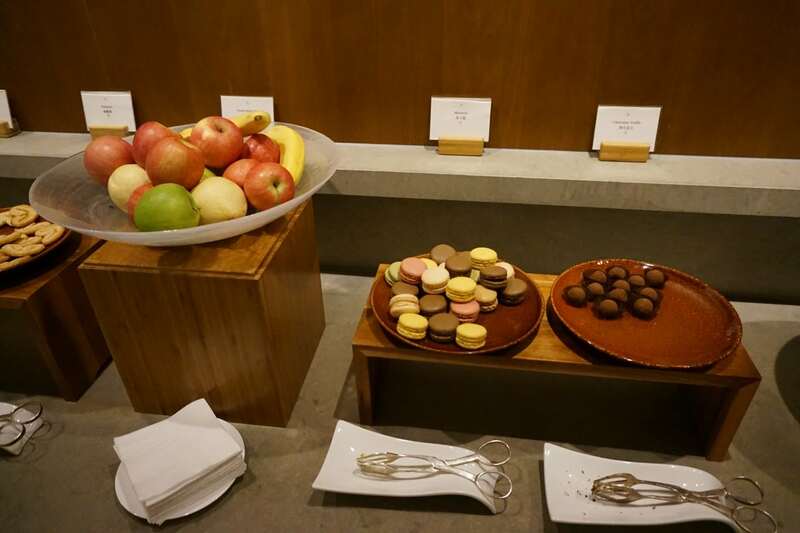 There aren’t actually any hot items here, but salad, pastries, sandwiches, wraps, fruit and the like are available. The selection rotates throughout the day, but this clearly isn’t the highlight of the lounge. 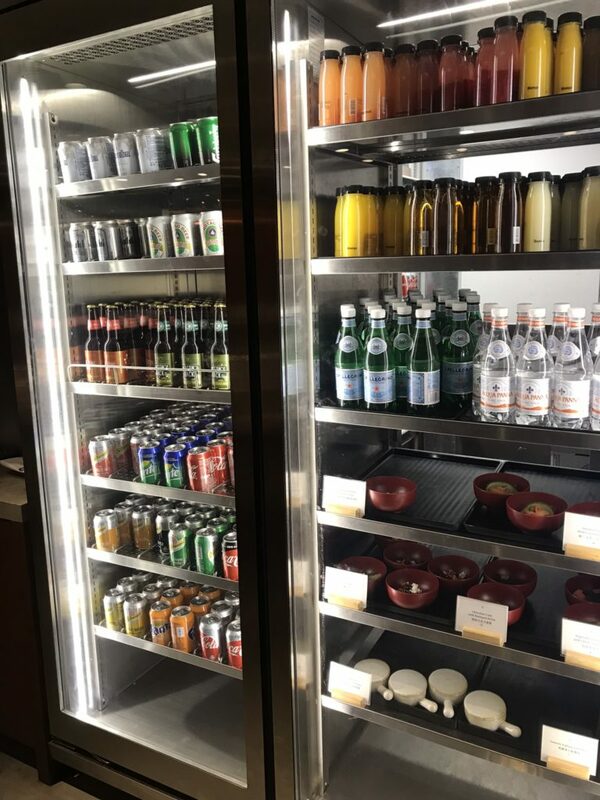 A special shout out to the drinks fridge, because any lounge offering help-yourself Acqua Panna bottles is just fine with me. I don’t care what you say, I can taste the softness. 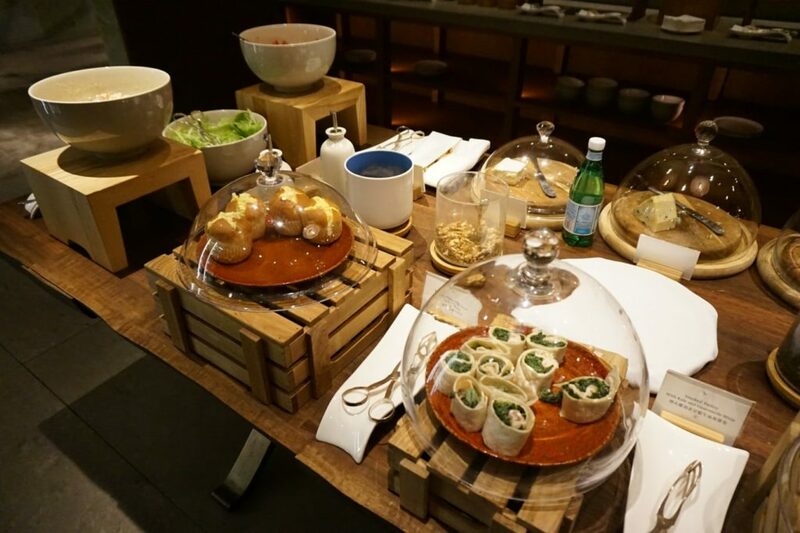 Of course, the whole point of flying First Class is to get enjoy a much higher class of dining experience, which is where The Dining Room comes in. The Dining Room is The Pier’s sit down a la carte restaurant. 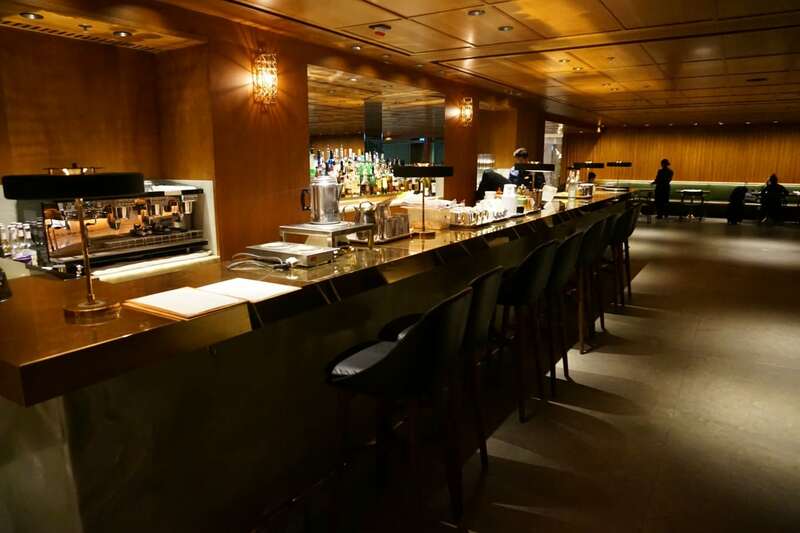 You’re greeted by a server at the door and ushered to a seat. The restaurant was fairly busy when we arrived, probably due to all the banks of late night departure flights. …or at any of the other tables. The staff aren’t too fussy about where you sit, and we were able to get seats in a section that looked at first glance to be closed off. Not forgetting, of course, the wine list. 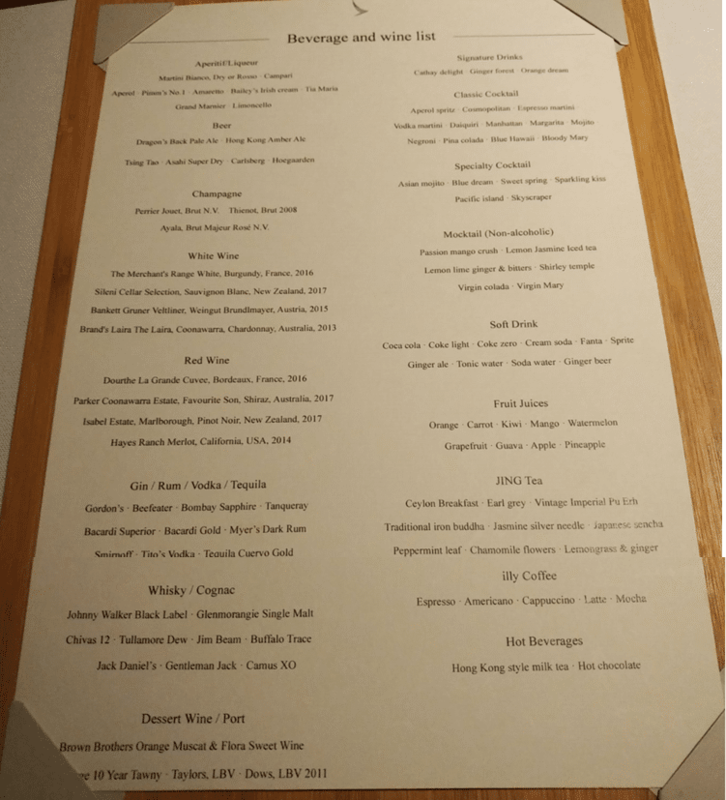 A total of four red and four white options were available, and the champagnes included Perrier Jouet, Thienot and Ayala. To start, we had the chili sesame prawns and fried tofu. The tofu appeared to be MIA, and given that two of us were sharing the dish I was a bit disappointed they didn’t upscale the portion accordingly as some places do. Otherwise, the prawns were cold and unmemorable. For the mains I was excited to try the Beyond Meat burger. Don’t get me wrong, I love a bloody steak as much as the next man, but having heard so much about this new plant-based protein I really wanted to try it. It was…not good. Beyond edible might be a better description. 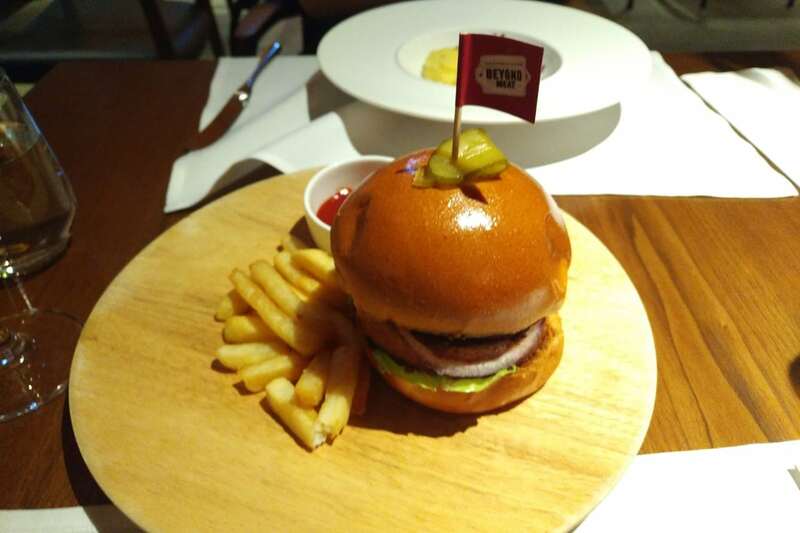 To be fair, it could just be that the kitchen staff didn’t know how to do it justice, but whatever the case the patty had a strange aftertaste and the consistency reminded me of undercooked steak tartar. 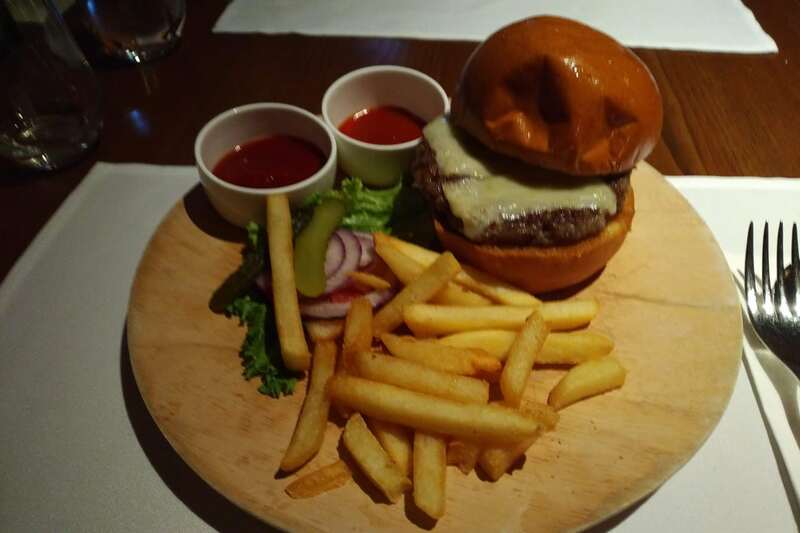 Realising my folly, I requested a good, honest wagyu beef cheese burger instead, which tasted a lot better. Bonus points to The Pier kitchen for offering steak cut fries instead of the usual shoestring ones. The Milelioness went with the wanton noodles, a classic item for Cathay Pacific. The noodles, sadly, were overdone, but the broth was exquisite. It had a rich taste that suggested a long-brewed stock, and the wantons themselves were firm with generous portions of prawns and pork. 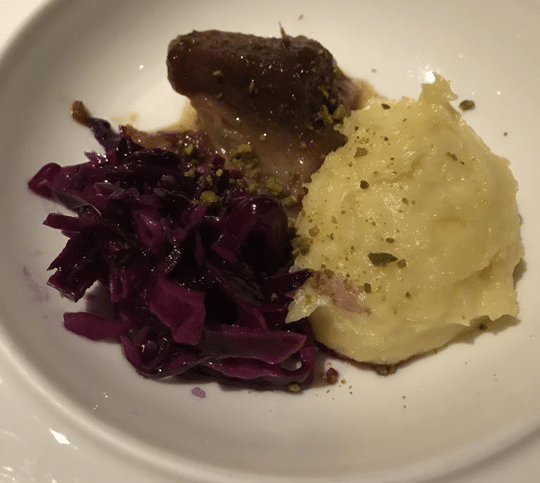 We also shared the braised beef cheek, which came with red cabbage slaw and potato mash. 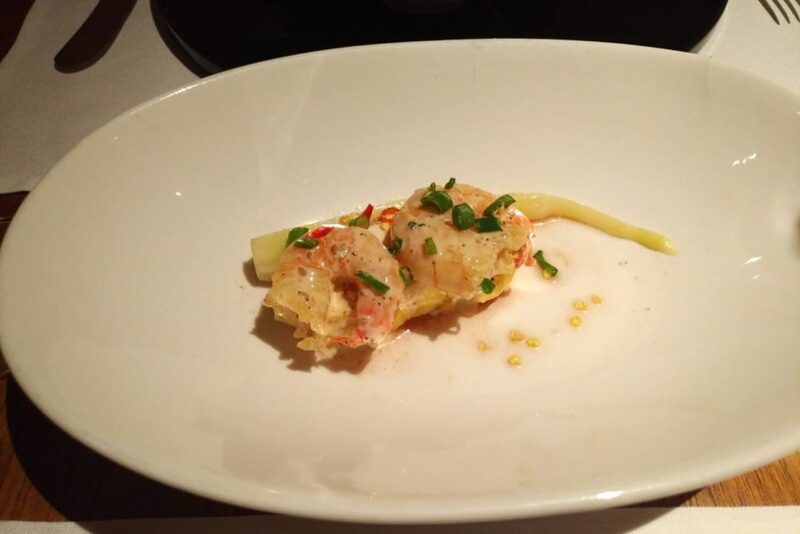 The beef was very fatty, which some people may like, but it ended up being too rich after a few bites. For dessert we tried the chocolate cake and the panna cotta. The cake turned out to be the better of the two, with a delightfully crunchy digestive biscuit base. 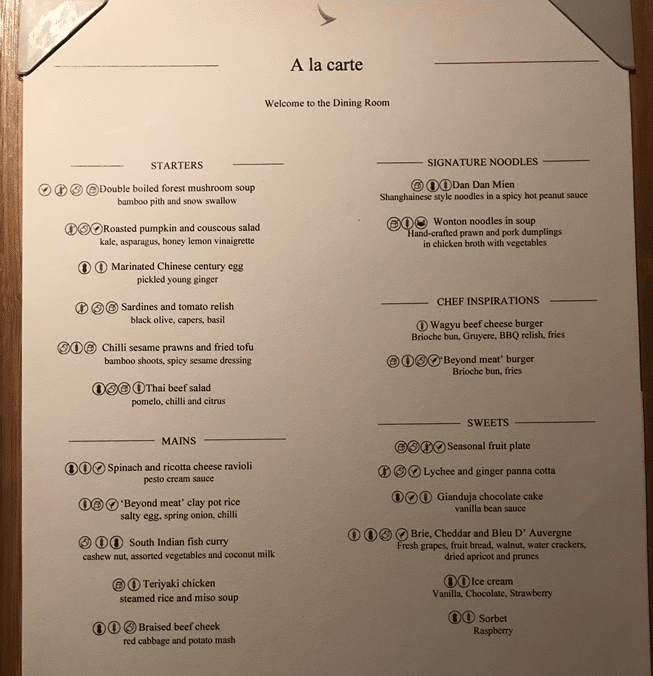 I have to say, the dining didn’t blow me away like I was hoping it would. The good news is the food seemed to be a lot better on the way back from the US, when we tried The Wing. Service was a bit hit-and-miss too. It was often difficult to get the attention of the staff, and simple requests like water required several reminders. After dinner we paid a visit to the bar, which is at the opposite end of the lounge as The Dining Room. It was crowded at first, but started to clear out real fast towards midnight as the premium-heavy long haul flights began to depart. Available for selection are eight beers, five whites, four reds, three ports, various gins/rums/vodkas and whiskeys. If you’d rather not sit at the bar, there’s always the option of living room style communal seating. 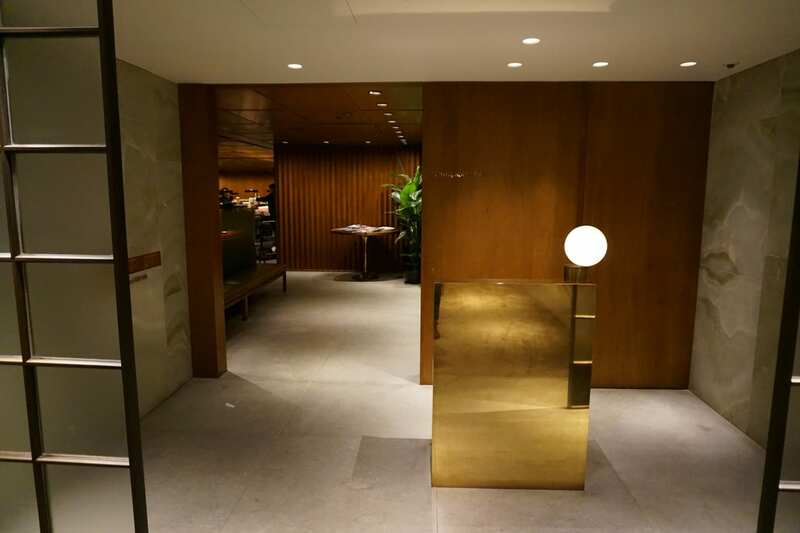 This forms part of The Library, another common feature at Cathay Pacific lounges. The seats here feature views of the tarmac. If you need to catch up on work, look for The Bureau. This work area has six large desks and Apple computers. 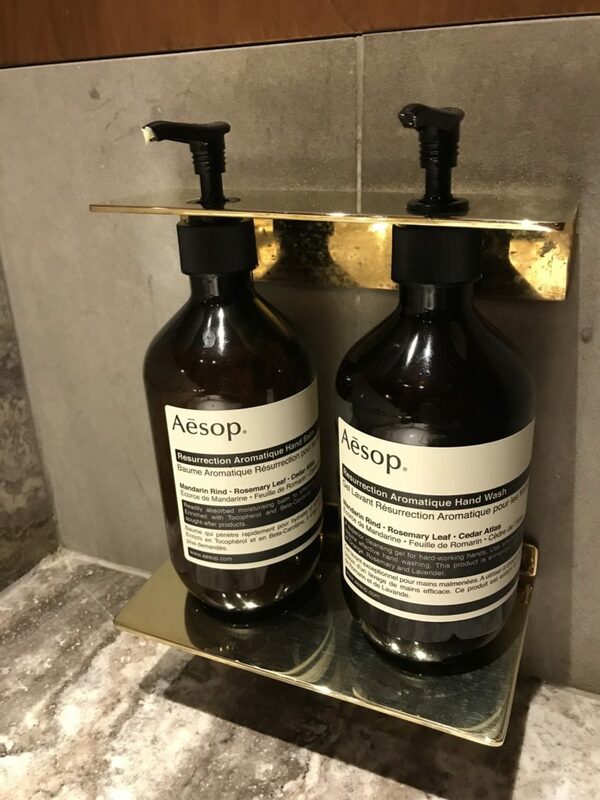 The toilets in the lounge are well-stocked with Aesop bathroom amenities, which is so ridiculously over the top because you’re literally (note to self: don’t abuse “literally) figuratively washing money down the drain. 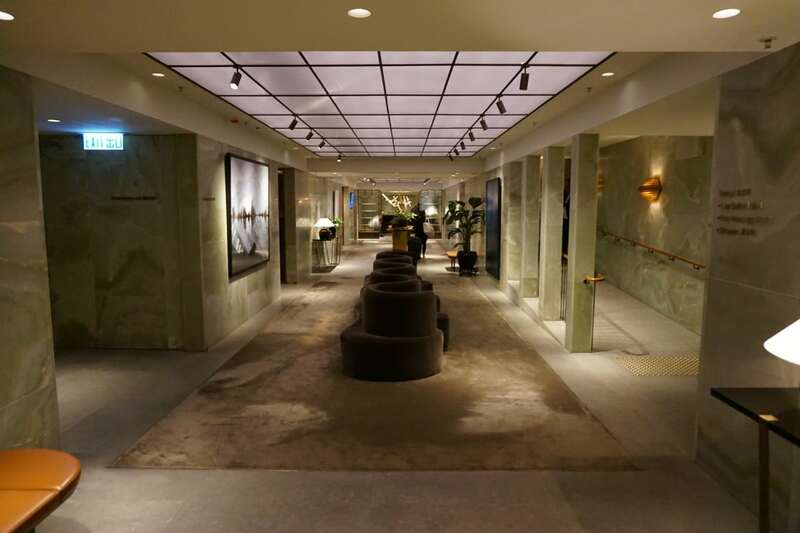 My guilty pleasure is to pop into the Aesop store just to wash my hands, so I had something of a field day here. Although The Pier does not have the lavish shower cabanas of The Wing, it does have 14 spacious shower rooms. A changing bench, hairdryer and en suite toilet come standard. 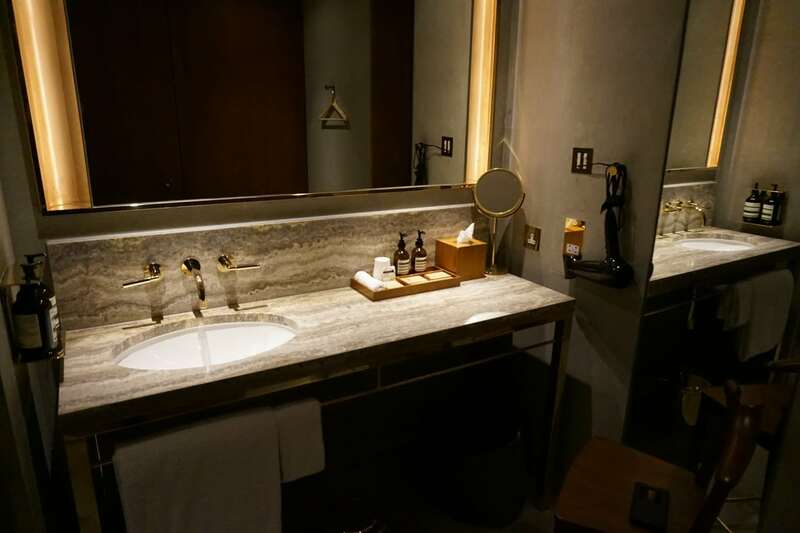 A limited selection of amenities is available in the room, and additional ones (like a razor) are available on request. 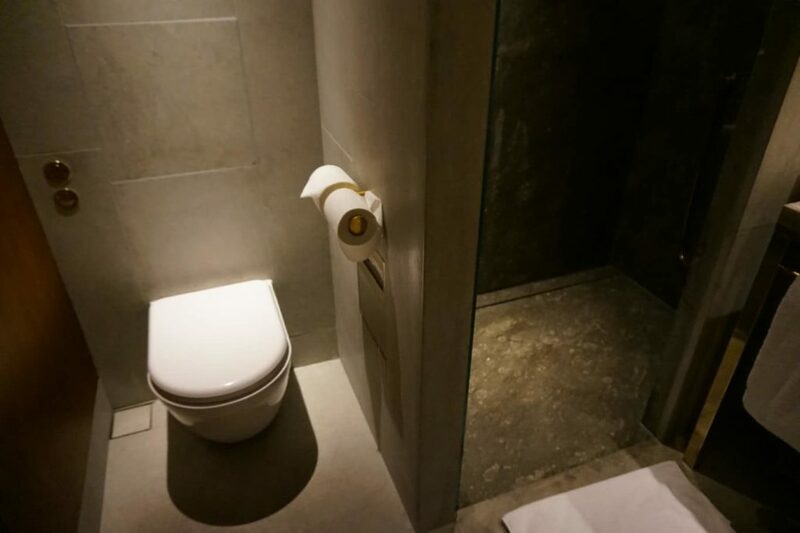 It’s such a shame that Singapore Airlines still does not have individual shower suites in its flagship lounge in Singapore (instead, the showers are located inside the communal toilet). That’s simply not good enough in this day and age, and one wonders when this will change. 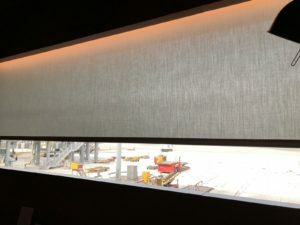 A final note about the day suites: we didn’t have time to visit them due to our truncated layover, but Louis has reviewed them in this report. To summarize, there are eight suites in total, and in theory you’re limited to 1.5 hours but the limit is not actively enforced. The suites have views of the tarmac, which is great if you like spotting aircraft but not so great if you’re a light sleeper. Although our trip to The Pier was short, it definitely felt like a place you could hang out for hours and not get bored. The interior design is beautiful, there’s distractions like spa treatments and day suites, and even though I feel the kitchen had a bit of an off day, there’s a good overall variety of F&B options. 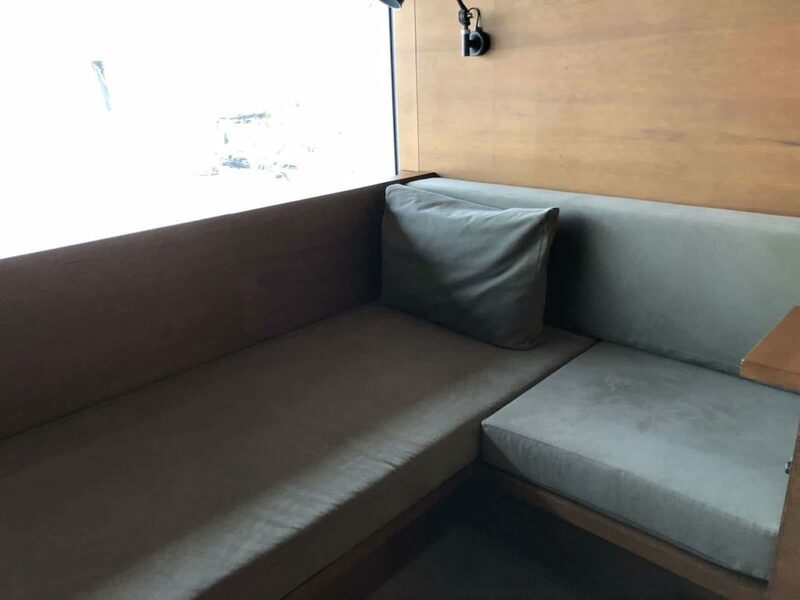 My main criticism of the lounge is that I don’t think it’s equipped to deal with the volume it receives. 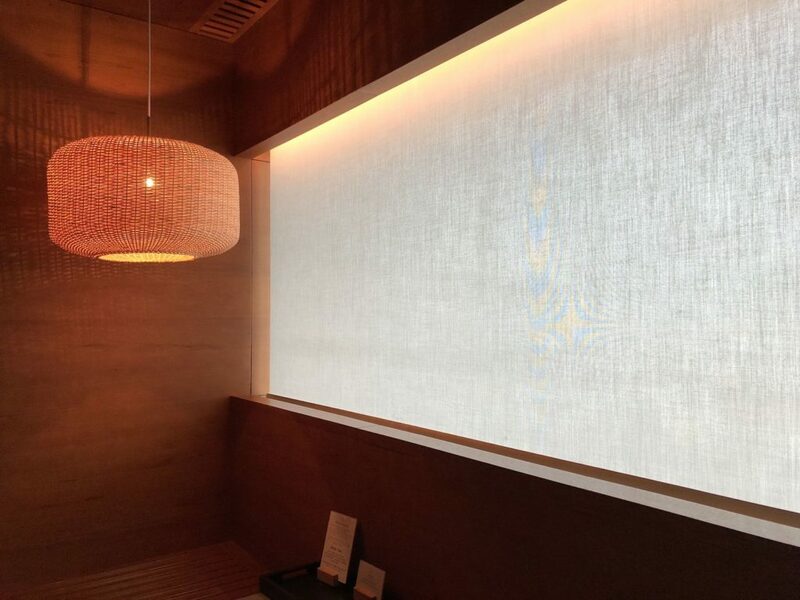 Based on other reports I’ve read, it’s almost impossible to secure a spa treatment unless you arrive immediately when the lounge opens, or have an extremely long layover. This suggests that the capacity of some of the facilities is well above what it can take, and this should be something that management looks at. Be sure to make a beeline for The Retreat as soon as you get into the lounge to book your treatment slot and day suite if you want one. 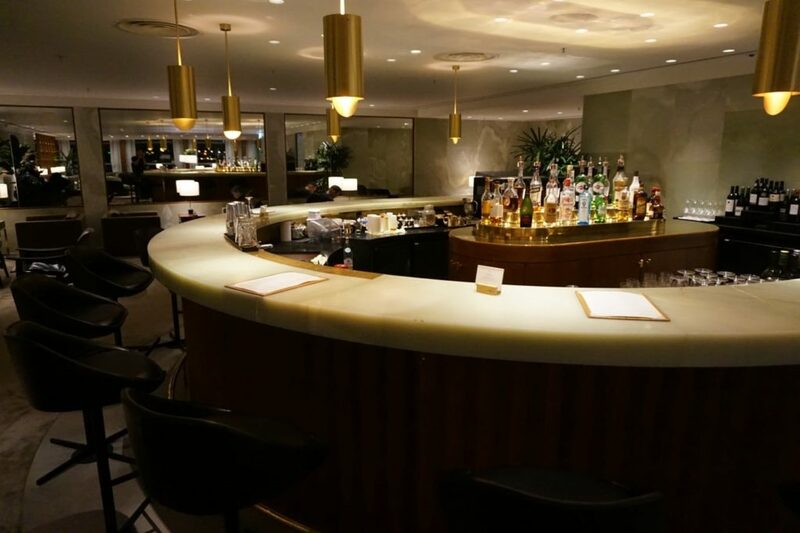 There’s no doubt in my mind that The Pier is head and shoulders above what Singapore Airlines offers in its home base with its First Class lounge and Private Room. 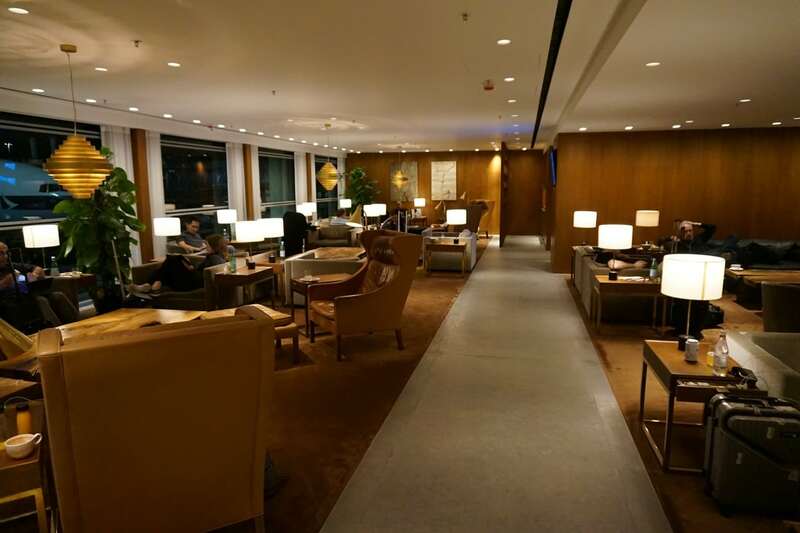 The airline keeps talking about overhauling its lounges at Changi, but up till today I haven’t seen any substantial work commence. I’d very much look forward to returning, hopefully with a longer slot to spend at The Pier. Did you get chased out at 12.30am ? I got 12 hours layover outbound and 9 hours layover inbound this September. would you suggest I do both lounges in one segment, or split it? Being a wanton mee fan, i had more than 20 wantons (can be served without noodles) spread over the dining lounges of Wing and Pier. The Pier’s was a notch better than The Wing’s, which made me wonder if they served different qualities in the Pier’s (First only dining) and the Wing’s (First/Business shared dining). 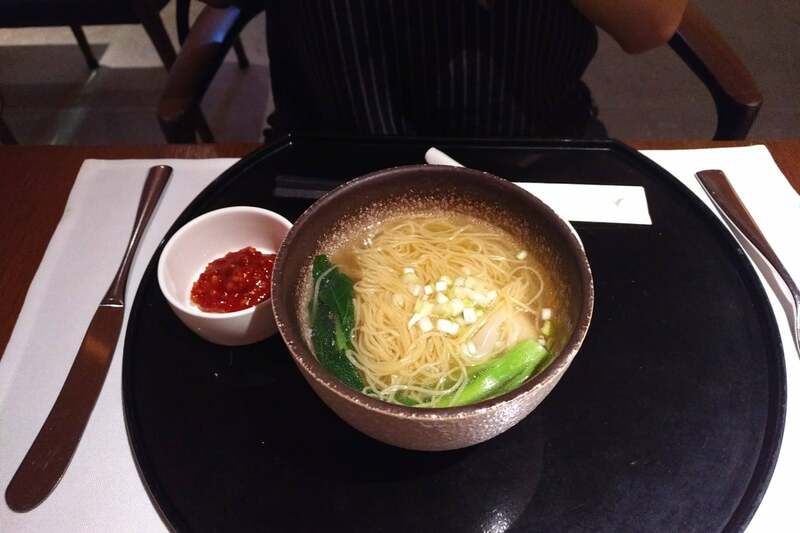 Oh, and i really hate that they served parsley instead of chives (韭黄) in your wanton mee soup in the SFO Cathay lounge – can someone please do some justice to the wanton mee there for a Hong-Kong based carrier lounge? 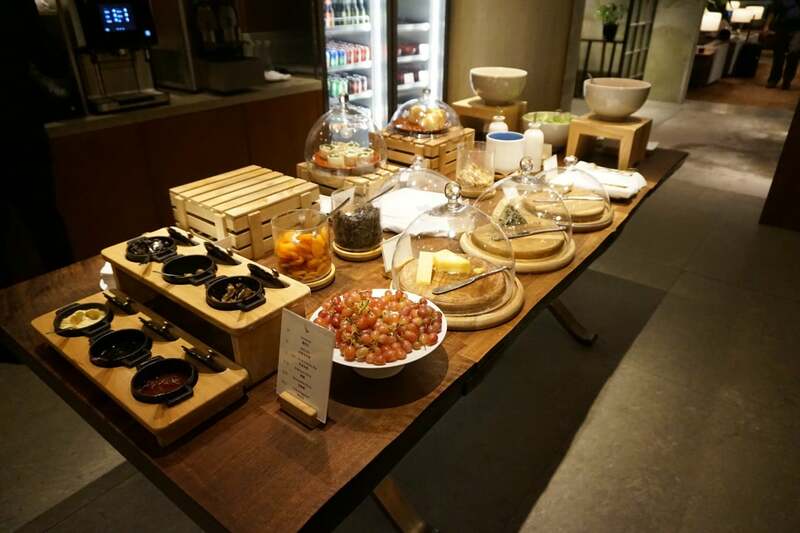 The catering in HKG suffered with the switch from Plaza Premium to Sodexo last year. Yes that is the same caterer that fuels our SG army food. 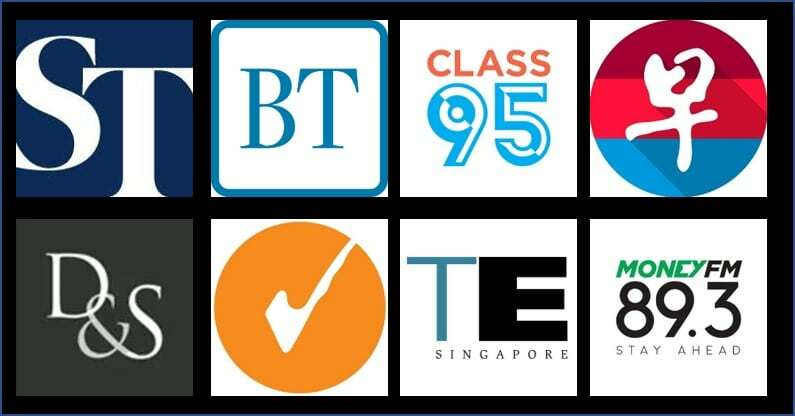 The selections now are already a notch higher than when they first started – but a pale comparison to the good old days when the Peninsula used to supply the food. 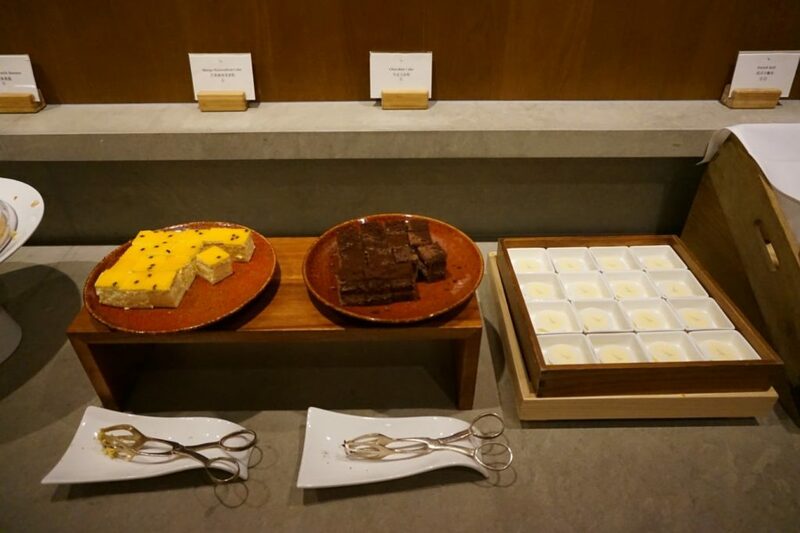 The best meals in HKG are at the QF lounge – lots of fresh western selections and a killer dulce de leche cheesecake. Try that on your next HKG hop.